This entry was posted on Sunday, April 21st, 2013 at 11:55 pm	and tagged with cardmaking, stamping, stickers and posted in Father's Day, Freshly Made, OWH. You can follow any responses to this entry through the RSS 2.0 feed. « Clean and Simple #236 Birthday: Do I Smell Cake? Lovely Father’s Day card! So nice of you to send it to OWH! I love it when I use up older items from my stash. Thanks for joining us this week at Freshly Made Sketches! Such a beautiful card and very generous of you to donate it to OWH. Someone will so happy to send AND receive it. Thanks for playing with us at FMS. 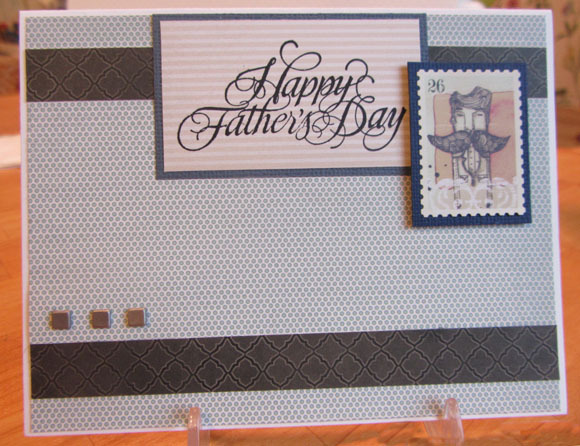 Such a great design and papers for a masculine card!